We’d love your help. 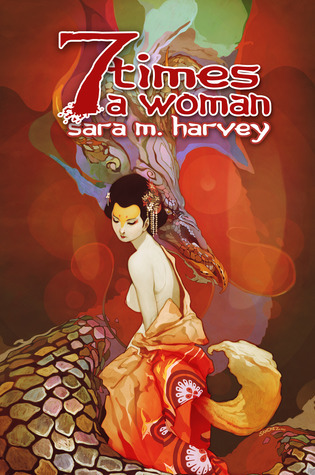 Let us know what’s wrong with this preview of Seven Times A Woman by Sara M. Harvey. In a mythic reflection of old Japan, the kitsune Rei-Rei is given the seemingly small errand to "tame a dragon" that will part her from her true love, Inari, for lifetimes to come. When the dark dragon Kage learns of her true nature, he seeks to strike a blow that will destroy his noble brother, and Rei-Rei, forever. To ask other readers questions about Seven Times A Woman, please sign up. As a Media Developer, Game Designer, and aspiring writer myself, I have worked on and with a number of projects with like minded themes over the years. I have been nothing short of inspired by not only this Novel, but all of Mrs. Harvey's Fantastic works of fiction. Her ability to express, visualize, and define vast worlds and diverse cultures both ancient, and mystical, has been nothing short of vivid, impressive, and often times awe inspiring to say the least. Her current novel, "7 Times a Wom As a Media Developer, Game Designer, and aspiring writer myself, I have worked on and with a number of projects with like minded themes over the years. I have been nothing short of inspired by not only this Novel, but all of Mrs. Harvey's Fantastic works of fiction. Her ability to express, visualize, and define vast worlds and diverse cultures both ancient, and mystical, has been nothing short of vivid, impressive, and often times awe inspiring to say the least. Her current novel, "7 Times a Woman" is by far the best piece she has ever written and in many ways rivals other Best-selling Historical Fantasies, such as "A Bridge of Birds", "Kushiels Dart", "Young Samurai", "Mistress of Rome", and even the now heavily proclaimed "Game of Thrones" series. As a single stand alone novel, this book stands far above the rest, both in content, historical fact, mystery, and very deep, very old, traditional legends of ancient Southern Japan. This review has been hidden because it contains spoilers. To view it, click here. I really, really enjoyed this book. I was expecting it to be a romance and it is that, but so much more. Harvey has wonderful characters. As we follow Rei Rei through her six incarnations, each one is real. Each one became someone I cared about, even identified with on some level. Harvey also manages to convey the time and place clearly. I am unfamiliar with Japanese myths and legends and found the premise very unique. I questioned the awareness of the women of their fate in I really, really enjoyed this book. I was expecting it to be a romance and it is that, but so much more. Harvey has wonderful characters. I am unfamiliar with Japanese myths and legends and found the premise very unique. I questioned the awareness of the women of their fate in life, but what do I know of kitsune, incarnated or otherwise? Like any other book I read, it was hard to get into until I read the basis for the story. Now I am reading the reincarnations and each one is perfectly different. Definitely not reading the same thing over and over. Its a story in a story and yet all tied together. I will recommend this book to friends. Other than "wow," I'm honestly not sure what to say about this book. It's beautiful and clever and reads like a fairytale, but for grown-ups. The spirited kitsune Rei-Rei is content in her life as the lover of the god Inari, but the goddess Benzai-ten has other plans for her. Rei-Rei's assignment is "to tame a dragon," namely the arrogant Sha Tano, who lives as a human lord in feudal Japan. The task will take many years, and is fraught with danger from Sha Tano's twin brother and from their own inner demons. The title, Seven Times a Woman, refers to the seven times Rei-Rei is born into human form and crosses paths with Sha Tano. Sara M The spirited kitsune Rei-Rei is content in her life as the lover of the god Inari, but the goddess Benzai-ten has other plans for her. Rei-Rei's assignment is "to tame a dragon," namely the arrogant Sha Tano, who lives as a human lord in feudal Japan. The task will take many years, and is fraught with danger from Sha Tano's twin brother and from their own inner demons. The title, Seven Times a Woman, refers to the seven times Rei-Rei is born into human form and crosses paths with Sha Tano. Sara M. Harvey does a great job with Rei-Rei, making her recognizably the same charming, stubborn character in each life while also showing how she's different each time depending on the circumstances of her birth and upbringing. As for Sha Tano, he's a dark, complex character and I confess I didn't like him for a lot of the time. During Rei-Rei's first incarnation, Sha Tano does something horrible, and when he repents of it, I was worried that *that* was the whole redemption arc, even though I wasn't that far into the book--after what he had done, I wasn't quite ready to accept him as worthy of Rei-Rei despite his repentance. He just kept doing things that made me mad and I hoped I wasn't supposed to love him yet! It was a really gratifying feeling when enough of these behaviors added up and I realized that he was still spiraling downward in some ways, that he still had more of his redemption arc ahead of him. The lesson Sha Tano was supposed to learn, and the desired outcome of his time with Rei-Rei, were not necessarily what one might expect. By the end I did feel compassion for him and felt like he had finally "gotten it." His brother, Kage, is far more complex than he appears at first glance, and his role in the story is also not what you might expect. Inari, Rei-Rei's first love, isn't on-screen much but I loved him every time he was. I've read this book a couple years ago. This is such a moving tale. I felt a personal connection to this book as a follower of Inari. The lore is authentic in regards to the deities in the book. Each one is accurate to everything I've researched in the past. The characters are believable in the way they act and interact. There is a lot of emotional times in this book that made it hard to read. I had to pause several times to balance my emotions. The life Reiri is a sad one and you will feel for her I've read this book a couple years ago. This is such a moving tale. I felt a personal connection to this book as a follower of Inari.